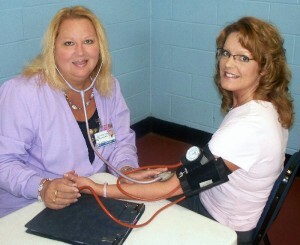 FULTON, NY – Rebecca Bettinger (left), of Oswego Hospital, prepares for OCO’s Cancer Services Program’s Women’s Health Fair by performing a blood pressure check for planning committee member Amy Conzone of Oswego Health. Scheduled for June 4 from 1 to 4 p.m. at the Fulton YMCA on Route 3, this free event, which is open to the public, will feature more than a dozen vendors and offer women an afternoon of fun, pampering and valuable information on women’s health issues. For more information of OCO’s Cancer Services Program’s Women’s Health Fair, contact Carolyn Handville at 315-342-0888, ext. 1455.